Our new QuickPad™ mounting pad with support base makes installation & mounting of Strong Box® enclosures easier than ever. No concrete is needed. 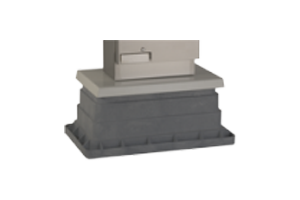 The mounting pad has our unique fastening system that allows for easy, secure attachment of the pad to the support base & the enclosure to the pad. The controller enclosure mounting pad assembly shall consist of a reinforced plastic support base, a three sixteenth inch thick 5052 H32 Marine Grade Aluminum mounting pad and stainless steel fastening brackets. The support base shall be installed and compacted in earth allowing the top two inches of the support base to be exposed above the earth. The 5052 H32 Marine Grade Aluminum mounting pad shall be clamped to the support base with the stainless steel fastening brackets. The controller enclosure shall be bolted from the inside of the enclosure to the mounting pad, thus preventing outside access to the mounting bolts. *QuickPads used for all StrongBox enclosures.